This collection contains public record legal briefs submitted to the Utah Supreme Court and Utah Appellate Court and supplied to the Hunter Law Library by the courts for the purposes of legal scholarship and academic research. Information about the policies for this collection and procedure for obtaining copies are accessible using the link at the bottom of the sidebar. 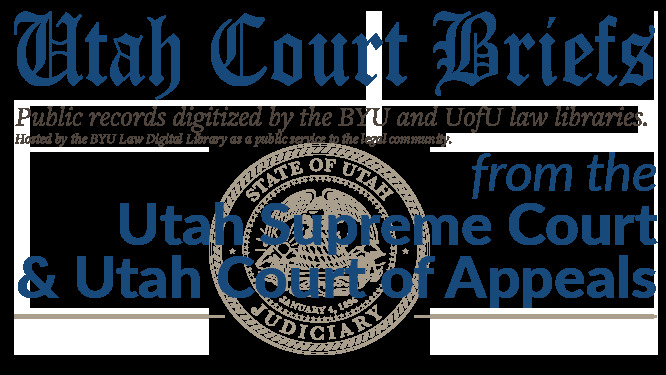 NOTICE: Pending adoption of a Utah court rules clarification about the classification of court briefs; full-text access to this database is restricted to the Utah State Law Library, UofU Law School and BYU Law School. In the interim, persons needing access to briefs from outside those locations must email the Repository Manager (link on the sidebar) with specific information about the needed records (such as the URL or docket number).